When it comes to lift systems, nothing is more important than reliability. 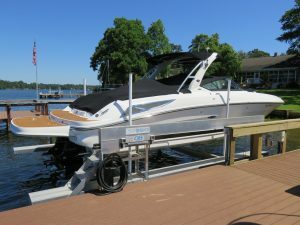 To ensure your new boat lift provides year after year of trouble-free performance, you should choose a manufacturer that has a long history of engineering high-performance products. You should also ensure that they incorporate features that reduce maintenance requirements, as constant upkeep will undercut the value you receive for your boat lift. It’s best to partner with a manufacturer that offers a wide range of lift system options instead of one-size-fits-all solutions. The company should also help you select a boat lift that works best with your specific watercraft as well as your property. This will ensure the lift system provides optimal performance and protection for your vessel and that your unique needs are met. DECO Boat Lifts has been a trusted boat lift manufacturer since 1959 thanks to our commitment to engineering only exceptionally reliable and high-performance products. We offer a variety of boat hoists to suit our customers’ unique requirements and budgets. Options include three drive systems, which range from a highly affordable entry-level model to the industry’s most advanced boat lift. And, our boat hoists are available in a variety of configurations to suit virtually any property and docking scenario. Contact DECO Boat Lifts today to learn more about the exceptional selection of boat lift systems that we offer in Cape Coral, FL.